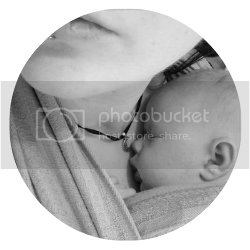 There's has recent been in the news the tragic story of the death of a five day old baby whilst being carried in a sling which inevitably has brought into question the safety of slings and babywearing. Nothing can detract the depth of tragedy in this case yet I also think it's important to keep perspective. 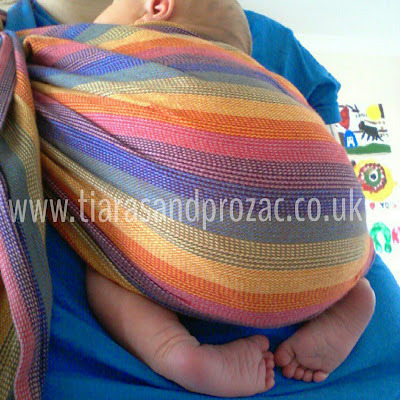 The reports all cite there have been six recorded deaths in the UK of infants in slings. One is right in thinking that any death, let alone six, is devastating yet this six isn't quoted as per week nor per month or even per year so one can only assume that that figure is six deaths, total. 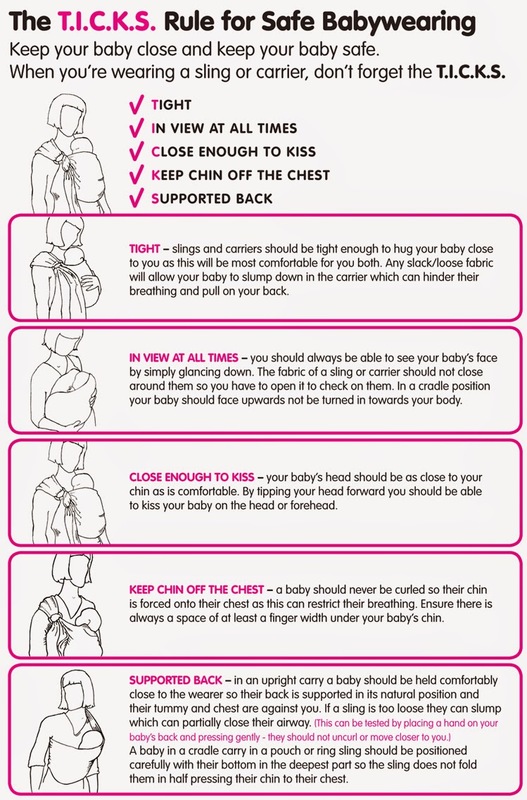 Lets also note that whilst throwing this figure around they do not expand on the matter as to whether the babywearing safety guidelines were followed nor the types of sling used especially as Infantino recalled two of their bag slings due to safety issues. If you dig around long enough you'll find stats to support human death in many commonly used and unlikely things too. The various reports state that the sling was used correctly as per instructions however it fails to disclose the type of sling used. 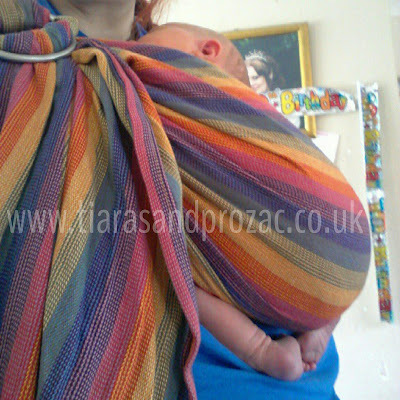 There is a world of difference in technically putting a sling on properly and in wearing it responsibly. Instructions may state what goes where yet whilst wearing there are several important factors to be aware of and check referred to as TICKS which are not found in any of the paraphernalia the NHS give to your nor in many slings bought. I'd like to see a copy of this displayed on the noticeboards, in the birth to 5 book even in the pesky bounty packs. If people don't know this information exists and is out there, how can they familarise themselves with it? Anything can be potentially dangerous. There have been multiple incidences of infant deaths due to prolonged time in car seats, do we roar about banning carseats or do we raise awareness and educate on the correct use-age of them? No baby should die it goes against everything we should believe in yet they do. It's awful, devastating and as a mum, quite frankly terrifying. In cots, in beds, in car seats, in prams, in slings and even in their parents arms. Although dubbed 'Cot Death' that is a misleading term for SIDS as SIDS doesn't discriminate, it can happen anywhere. We now know that infants should not spend prolonged periods of time in a cars seat and should not be encouraged to nap/sleep in them. We now know that you shouldn't co-sleep if you smoke or drink etc. We now know that baby should be places in a cot with feet to the bottom, on their backs. All we can do as parents is to assess risks and address them. To make whatever we do as safe as possible. It's like co-sleeping, when done safely it has many benefits yet rather then educate on how to do it safely, the media regale us with horror stories of bed sharing gone wrong. It's potentially dangerous to cross a road, to travel in a car etc do we cease to do so or do we educate ourselves to minimise the risks? My deepest and sincerest condolences go out to the parents of this baby and indeed to any parent who has suffered the agony of infant loss. There are simply no words that can eradicate your pain. Just the very existence of such tragedies chills me to the bones and makes my heart ache. I'm a babywearer. Will I cease to do it? No. Will I babywear Moomin when she arrives? Yes. Am I being irresponsible? No. It's about being informed. In my opinion the benefits to both mum and baby from babywearing, when combined with safety awareness, far outweigh the potential dangers. So, once you've mastered a) putting the sling on and taking it off and b) putting baby in and taking it out again it's vital you familiarise yourself with TICKS. Please also keep in mind that the 'cradle position' is no longer recommended nor safe to carry your baby. Regardless of sling your newborn should be in a tummy to tummy position. If you're at all worried about using your sling and would like some advice, please do look up your local trained Trageschule consultant or pop in to your local Sling Meet. This is a fantastic post, hon, nicely done! So important to keep sharing this information! Absolutely, against the missile of fear the best Armour is knowledge.